HOW can people prepare to have the conversation about what matters most in life and HOW can they prepare for medical decision making? A new, interactive, easy-to-use, advance care planning website called PREPARE can help (www.prepareforyourcare.org). PREPARE shows people, through videos and a step-by-step process, HOW to have the conversation and make informed medical decisions. I have been profoundly struck by examples in my own family and from my geriatrics and palliative care patients, that most people lack a framework to face complex medical decisions when they arise. We, the healthcare establishment, admonish people to do advance care planning, by which we often mean to fill out advance directive forms focused on hypothetical scenarios and preferences for life-sustaining treatments such as CPR. Because no one can predict all unforeseen medical and personal circumstances, this approach to advance care planning does not always help when faced with a medical crisis. What we often don’t do well is to teach people HOW to identify what is important to them in life and how they want to live; HOW to communicate their wishes to their family and doctors in a meaningful way that can affect their medical care; and HOW to face complex and often scary, in-the-moment medical decisions in the context of their deeply held beliefs and values. We set out to change that. We have created an interactive website called PREPARE that is focused on teaching people the skills they need to identify what is important in life and the language they need to communicate this information. PREPARE focuses on the “HOW” and not just on the “what”. There are many helpful advance care planning tools. However, based on a series of 13 focus groups of patients and surrogates from diverse backgrounds and our prior research, we developed PREPARE to fill in what we saw as fundamental content and functionality gaps of currently available tools, especially for older adults from culturally diverse backgrounds (see links to research references below). PREPARE walks people through an easy-to-follow, 5-step process. 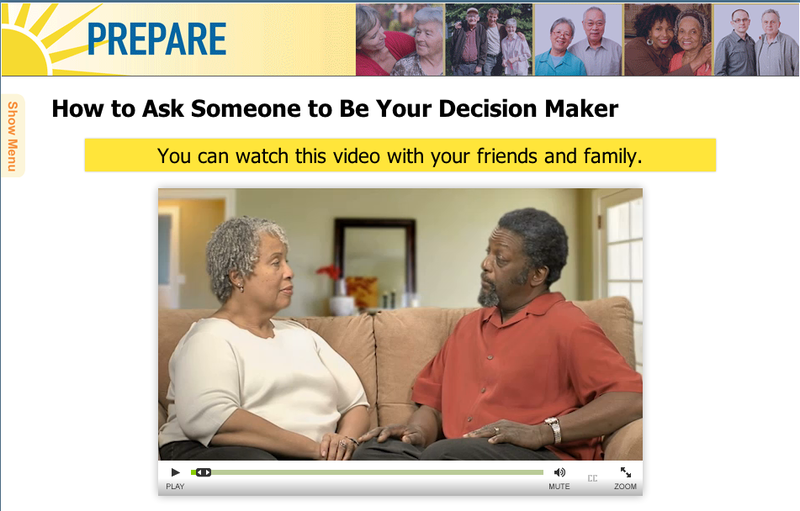 We recognize that advance care planning comprises not just one, but several steps, such as choosing a medical decision maker and asking her or him to play that role, deciding what matters most in life, discussing leeway in surrogate decision making, learning how to tell others about one’s wishes, and learning how to ask clinicians questions to make informed medical decisions. We developed PREPARE to help people engage in each of these steps in a systematic way. PREPARE is focused on preparation for decision making and communication skill-building instead of asking people to make often premature decisions about specific medical treatments. We developed PREPARE to give people the tools to identify what is most important in life, the concrete skills to communicate these wishes, and to provide a framework to prepare people for informed medical decision making. PREPARE is appropriate for any stage in life or illness. PREPARE is focused on empowering the individual, not just the medical establishment. We designed PREPARE to be completed outside the clinician environment, not as a substitute for a conversation with a clinical provider, but as a way to prepare people before these conversations. This empowers the individual and may save the clinician time. We targeted PREPARE to a 5th grade reading level with large font, and large intuitive buttons. If desired, we also included voice-over of all text for individuals who have poor vision or difficulty reading, and closed-captioning of all video content for those who are hard of hearing. People with deficits in reading, vision, and/or hearing are vulnerable to making uninformed medical decisions because of a lack of understanding. PREPARE aims to change that. PREPARE includes concrete, video demonstrations. We developed videos that show people HOW to do each of the 5 steps, for instance HOW to identify a good surrogate decision maker and HOW to ask them to serve in that roll. The content of PREPARE is the result of extensive research, 13 focus groups with patients and surrogate decision makers, and input from older adults from culturally diverse backgrounds. We attempted to provide culturally balanced content, such as including photos and video actors from a range of race/ethnicity backgrounds. In addition, we provide content for individuals who prefer family or group decision making, people who prefer to not be active participants in their own medical decision making, people who prefer aggressive treatments, and people who prefer comfort care. PREPARE is tailored and interactive. We developed content that is tailored to each person’s individual needs and preferences. For instance, individuals are tracked to view different content depending upon whether or not they have a potential surrogate decision maker, whether or not they have family and friends involved in their life, and whether or not they want to be involved in their own medical decision making, etc. People can choose the content this is most appropriate to their situation. We developed questions that are asked throughout PREPARE, such as who may be able to play the role of a surrogate decision maker, whether or not this person has been formally asked to play that role, what is most important in that person’s life, etc. PREPARE then collects this information into a summary for the individual to review the preparation steps they have and have not completed. The user is then asked to make an action plan to complete one of the steps in the PREPARE program. Participants are encouraged to share the summary and their action plan with their clinicians and with their family and friends. PREPARE is free to the public. We decided early on to make PREPARE available to anyone who was interested. We depend on grants and donations to keep it going. 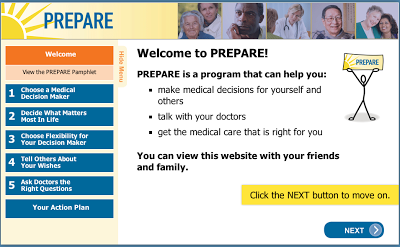 We have conducted preliminary studies, currently awaiting publication, that demonstrate PREPARE is easy-to-use by both younger and older adults, that people like the website and are willing to use it, and that PREPARE results in significant improvements in confidence and readiness to engage in advance care planning and to communicate one’s wishes. I believe the tide is turning in America, and that people and their families are more open to talking about what is most important in life and for their medical care. They just need a road map. We hope that PREPARE, along with other excellent advance care planning tools, can help be the road map that empowers people and their families with concrete skills to identify and communicate their wishes and to make informed medical decisions. Advance Care Planning Beyond Advance Directives: Perspectives from Patients and Surrogates J Pain Symptom Manage. 2012 Nov 27. Redefining the "planning" in advance care planning: preparing for end-of-life decision making. Ann Intern Med. 2010 Aug 17;153(4):256-61. We created PREPARE with financial support from the Department of Veterans Affairs; the National Palliative Care Research Center; the Steven T. Bechtel Foundation; the Hellman Family Foundation; with blood, sweat, and tears; and a great deal of support from colleagues, friends, and family. Rebecca- This is amazing! I've already shared it with my group (and run through it myself). It is so great an user-friendly. Impressive work, as always, Rebecca. Rebecca--This is amazing work. It's really easy to use, as well as understand. The videos are terrific. I've sent to our division. Great job! Congratulations Rebecca! The team at MyDirectives.com looks forward to working with you to help consumers turn the wonderful content on PREPARE into actionable advance care plans! Thank you Rebecca, this is wonderful. I am assisting with the training of PACT teams in VA and I am going to make sure that they see this resource. Did you have any collaboration with VA Ethics? Rebecca -- Much thanks to you, the team, and the funders for this terrific new product. My colleagues and I at HealthCare Chaplaincy will promote it soon to the readers of our online professional journal for chaplains and other spiritual care providers "PlainViews" as well as our more consumer-focused e-newsletter. Discussed this today in our Geriatrics didactics session. I missed this the first time around. Looks like a useful tool. Thanks for sharing (and making it free for public use).